"Men won’t succeed in literature that they may get into society, but will get into society that they may succeed in literature." – Jasper Milvain, the social-climbing journalist in George Gissing‘s New Grub Street, his classic about the London literary world more than a century ago. Question: Substitute “Web,” “Facebook” or “Twitter” for “society,” and would be the above apply to the Internet era? Maybe. But I suspect that the traditional social component would still count as well, at least when it comes to mention in the mainstream media. As a success story, Gissing cites a "clever, prolific" writer named Ralph Warbury who "began with money and friends; he came from Oxford into the thick of advertised people; his name was mentioned in print six times a week before he had written a dozen articles." 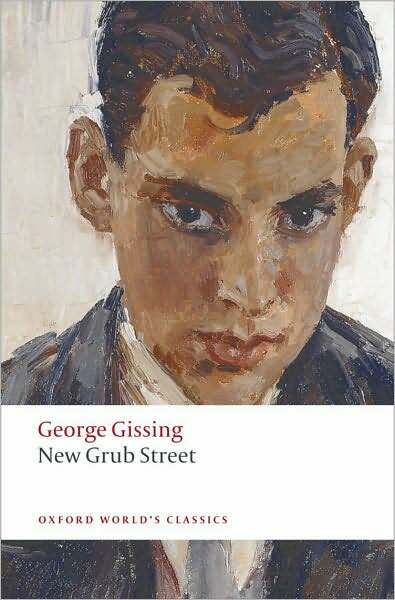 Then Gissing goes on to the quote at the top of this post. Warbury seems to be imaginary, but I certainly can think of his real-life equivalents today here in the States, especially with such a fixation that many Washingtonians have on Ivy League degrees. If nothing else, remember the five Ws and the H—who, what, why, when, where and how—taught to American journalists. Guess which one comes first. I hardly doubt that the same is true in the Gissing’s country. Edwin Reardon, an unlucky novelist without social contacts, is Warbury’s opposite in New Grub Street, the man who’s “who” is found deficient. "His books are not works of genius,” Gissing/Milvain says, “but they are glaringly distinct from the ordinary circulating novel. Well, after one or two attempts, he made half a success; that is to say, the publishers brought out a second edition of the book in a few months. There was his opportunity. But he couldn’t use it; he had no friends, because he had no money. A book of half that merit, if written by a man in the position of Warbury when he started, would have established the reputation of a lifetime. His influential friends would have referred to it in leaders, in magazine articles, in speeches, in sermons. It would have run through numerous editions, and the author would have had nothing to do but to write another book and demand his price. But the novel I’m speaking of was practically forgotten a year after its appearance; it was whelmed beneath the flood of next season’s literature.’"
Alas, by way of Facebook, Twitter and other services—especially now that they have added location-based features favoring those who hang out at the right restaurants—I fear that the worst of the Net and the worst of real-life society will converge and social class may ultimately end up mattering even more than in Gissing’s time. The rich can hire PR services to work not just the mainstream media but also social media. Total costs may amount to tens of thousands of dollars, a problem aggravated by many publishers’ eagerness to shift expenses to authors. Furthermore, in well-off areas like D.C., many Americans have regressed to the snobbery of the Victorian age. I can vaguely recall reading advice some years ago from a local book critic—son of a steelworker—that children should take dancing lessons. And how about the tennis factor? Could it be that American literature is becoming even more like finance, where social connections, on and off the Net, so often count more than actual merit? That would be nothing new. But if the number of Nobel Prize winners is a clue—and I won’t say it is for certain, though it might be—maybe that is one reason why some believe that American literature isn’t what it used to be. Time for the Reardons to matter more than today?